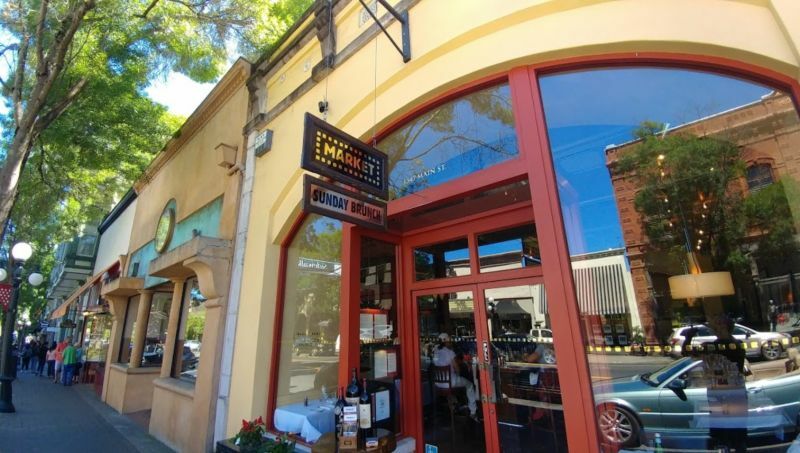 We had lunch at the Market Restaurant in the charming little town of St. Helena on our way to the Castello di Amorosa for a reserve tasting. We had stopped in for a drink several weeks before and had enjoyed the service and atmosphere, so we thought we would try their food. The restaurant is lovely. 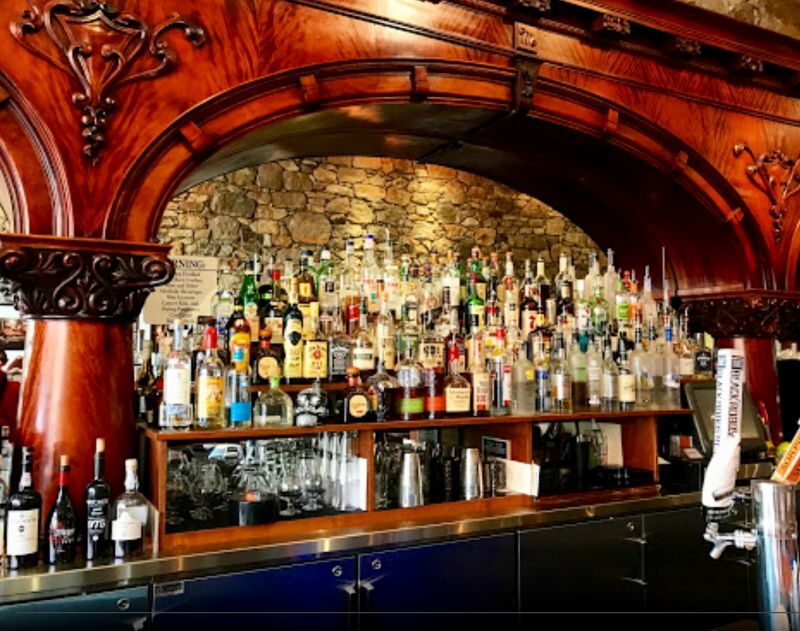 A gorgeous antique wooden bar dominates the space as you enter, then your attention is drawn to the art washed by soft lights on stone covered walls. There were three of us on both visits, and both times we all commented on how pretty the place looks. Our waiter Alfie was amazing; friendly and outgoing. He was quick with the wine menu and water. He was very attentive and I liked his personality. He even gave us some tips on what wineries to visit in the area. I liked that extra little touch. 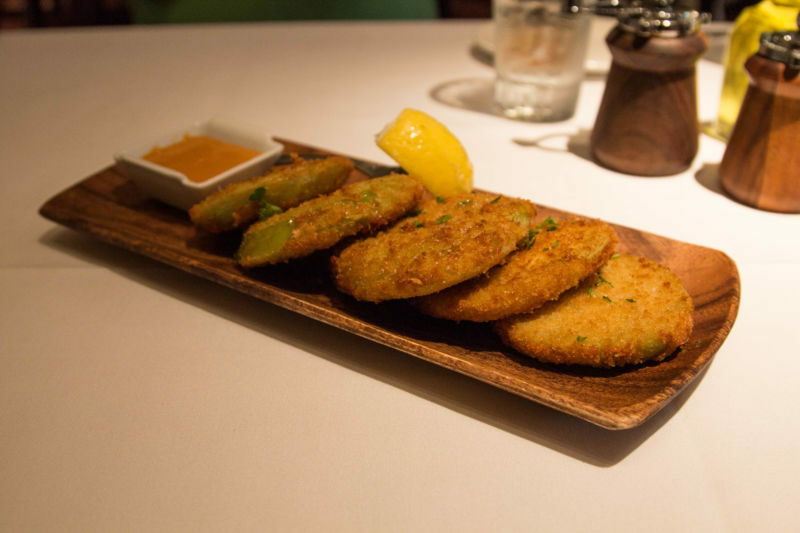 I saw that they had fried green tomatoes on the menu and my heart skipped a beat. Not only were these what I had been dreaming about since I visited Texas, but these were heirloom tomatoes. I was so excited I could hardly contain myself. 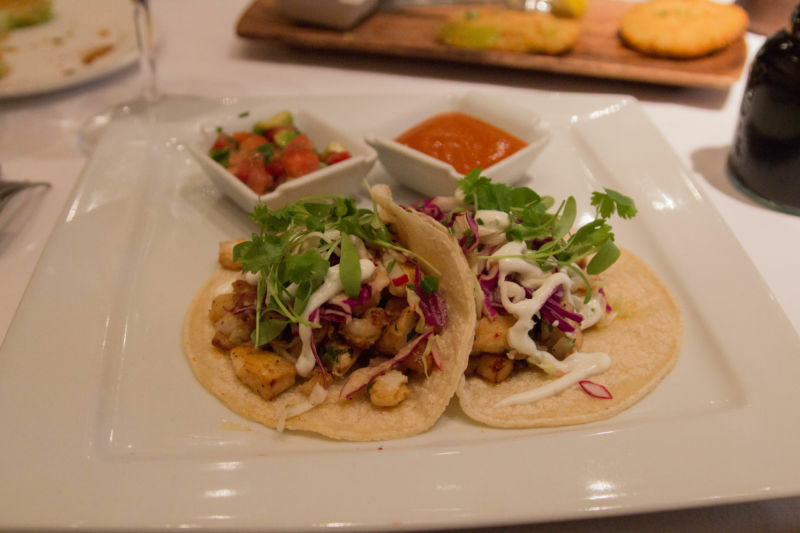 They also had another of my favorite items on the menu: fish tacos. I was immediately sold! The Brit, of course, saw the Fish and Chips and felt the need to order them as the example he had just eaten at The Norman Rose Tavern hadn’t satisfied his craving. Our dining companion Ms. April (the healthy one) ordered the watermelon and mozzarella salad. I am sure she did it to make us feel like porkies, but we ignored her good eating habits and carried on with our evil, calorie laden plans. 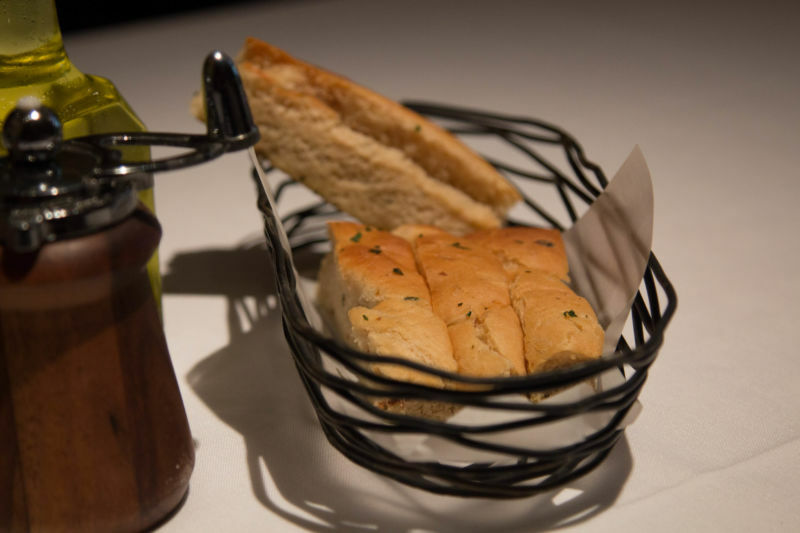 Alfie brought us a basket of what looked like bread sticks crossed with focaccia. I looked at them carefully as they had the shape of sliced focaccia without the appearance or texture. When I took a small bite I was surprised that the bread was a little sweet; reminiscent of an Hawaiian roll. The texture was a little doughy; good, but not at all what I was expecting. When the fried green tomatoes arrived I was so excited. They looked beautiful. Nicely plated and with a golden coating. Then I took a bite; I was really sad. It did say on the menu “flash fried”, but never before have I had them hard and crunchy. It was as if the tomato wasn’t cooked at all, just an unripe tomato with a crispy coating. I stabbed my fork in each slice, until I found one that was cooked. That one was great; good flavors and a soft interior that didn’t crunch in my mouth. The sauce that came with the tomatoes was also not worth eating. We left the plate basically uneaten. When we were served our main courses, my plate looked awesome. Two small fish tacos that looked both fresh and appetizing. I wish I could have said the same about the other two plates. 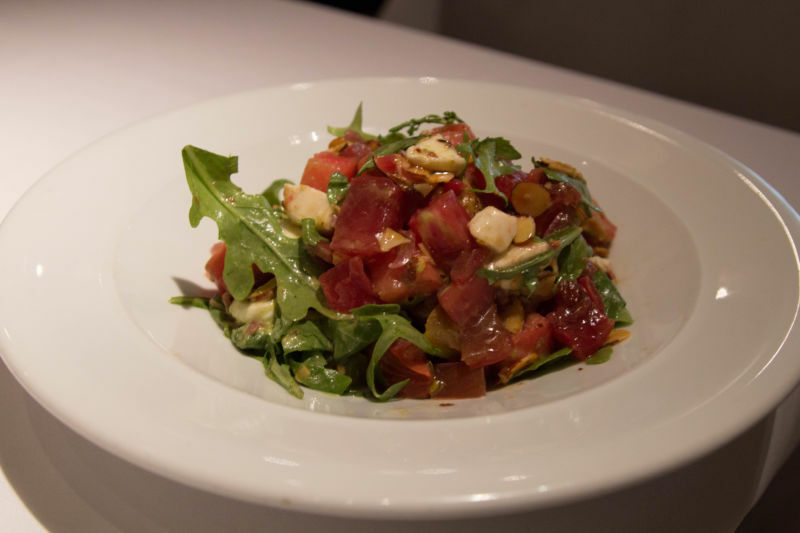 April’s salad looked as though the watermelon was mushy and over ripe and it was over dressed. The Brit’s plate was better. 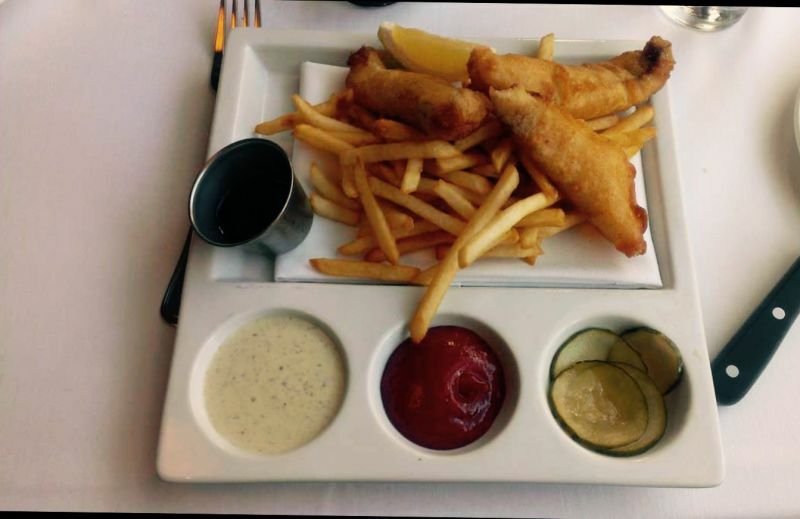 It was served on a cafeteria type tray with little separate cups for each condiment. The fish looked a little light to me and they served thin french fries with it, but otherwise it looked fine. The Brit comments: If a restaurant is serving fish and chips, it needs to serve thick chipped potatoes and not skinny French fries. I think that the next time I see this dish on a menu, I shall check with the waiter before ordering. Biting into my tacos was a joy; they were fresh and beautifully cooked. I enjoyed the salsa they provided with my plate. It was a very delicious, but very light meal as there was no rice, beans, or salad served with them. I loved the texture difference in the two kinds of fish. Ms. April’s salad was a little less impressive. She didn’t care for the slivered almonds as she felt it was a weird combination with the other components. Moreover, they stuck to her gums as she tried to eat. She didn’t feel that the dressing was a good complement for the salad; I had to agree. Finally, the watermelon was less than perfect and fresh. It was disappointing. The Brit’s fish and chips were only ok. He ate them with a bit of a sad face. I did try his plate and it was indifferent, at best. Even the tartar sauce wasn’t very good; the flavor was actually odd. The one stand out on his plate was the very thinly sliced pickles. They were so unique. They were spiced with turmeric and coriander. The Brit comments: The batter had an excellent texture, with an appropriate level of seasoning. However, the fish was not as flaky and juicy as my recent experience at Norman Rose. Once again I found myself disappointed with the execution of this dish. My hunt for the best fish and chips in Napa Valley continues. I really wish that I could give Market Bistro a great rating, but I just can’t. 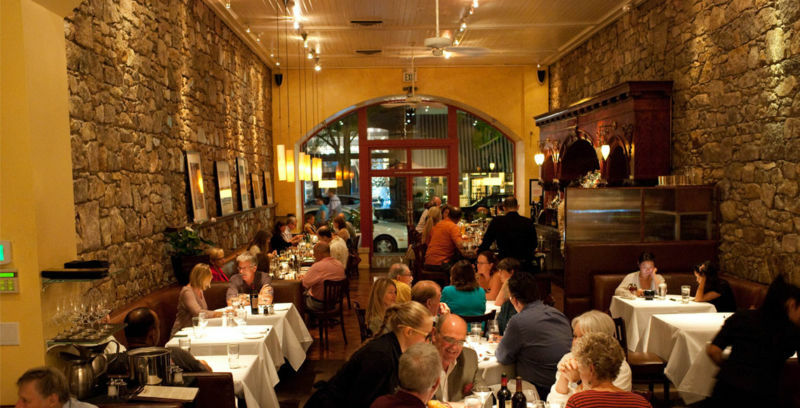 It has good quality service and a delightful interior, but the food just wasn’t that good; especially for the price. They have great ideas, but they need to work out a few kinks.